Originally Published August 21, 2014 in the Page News and Courier, by J.F. McMillan, Staff Writer. LURAY, VA. July 31, 2014 – With many factories closed and high unemployment, one bright spot for Page County is to create jobs through its economic HUBZone designation. SHINE Systems and Technologies, a HUBZone certified company, recently relocated from Shenandoah to Luray. In operation since 2008, Shine provides management consulting, analytical and technical services to the federal, state and local government. President Jeff Thomas (center) cuts the ribbon with SHINE Systems’s finance department employees. 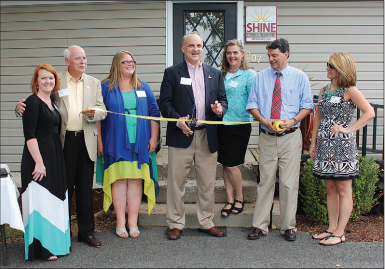 Celebrating its grand opening earlier this month, SHINE currently has six Page County residents as employees at 207 Collins Avenue in Luray. The new office, within close proximity to Washington D.C., is primarily a support element to manage financials and travel coordination for the defense industry. The U.S. Small Business Administration (SBA) encourages small businesses to create and sustain business activity in economically depressed areas. To obtain certification, a business must have a principal office within the county and maintain at least 35 percent of its employees residing within Historically Underutilized Business Zones (HUBZones). SHINE Travel Coordinator Denise Aleshire, of Page County, won the 2013 National HUBZone employee of the year award. Founder and President of SHINE, Jeff Thomas, said that the new Luray location aims to double in employee size over the next few years. INC magazine ranked SHINE at number 307 out of 500 fastest growing companies in 2013, when it went from $5.8 million to $13 million in sales from 2012 to 2013. SHINE Systems is planning a job fair to be held in the next few months. The Luray-Page Chamber of Commerce is coordinating the event. Robbins said it is a solid advantage for companies to come here with connections to Northern Virginia — as three percent of federal contracts must go to HUBZone companies. Nine different HUBZone companies attended the SHINE opening, including Syntelligent Analytic Solutions and MEC Associates, along with Premier Technical Services. Syntelligent CEO Stephen Synnott employs nine employees in Luray, to provide support to the Veterans Ad-ministration at 320 Hawksbill Street. Synnott is working with the EDA to coordinate programs for Page County HUBZone companies to collaborate on opportunities. Page County Economic Development and Tourism Director Stephanie Lillard has applied for the Virginia Enterprise Zone designation as a county-wide designation, to include geographical areas within the individual towns. The county and each town provided support for the application process that Lillard said needed to be more specific than last year’s submittal that was denied. In addition to local incentives, said Lillard, the state may offer two incentives, which include: a Real Property Investment Grant (RPIG) and/or a Job Creation Grant (JCG), to qualified investors and job creators. The designation application is awarded through the Department of Housing and Community Development (DHCD) based on a locality-wide distress score — Page County’s is 479 of 750. Last year, the county scored 353, which indicates that the county is going in the wrong direction. Distress scores are based on a combination of the locality’s fiscal stress ranking, unemployment rate, median household income and the percentage of public school students receiving free or reduced-price lunch.